It is every homeowner’s dream to have the best features their home can have. If your pool area is not giving you the satisfaction you crave, you may consider giving it a makeover. It does not have to involve something tedious and costly like taking out the old pool deck and installing a new one. It could include resurfacing pool deck surrounds areas, updating lighting, adding a swim-up bar, and maybe adding some cool water features. Whatever it is that you think would make your pool area better, it is essential to know your options. As you walk into the pool area, the first thing that you see is the pool deck that surrounds the swimming pool. As much as it is vital to make it look stunning, it has to be safe. Decorative concrete offers a pool decking solutions that combines beauty, durability and low maintenance (when sealed correctly stamped concrete will resist harsh chemicals, water exposure, and fading). We suggest mixing in a non-skid grit additive to the sealer to prevent your deck from getting slippery when wet. You have the option to stamp patterns like stone, brick, or any textured material look. You may choose a spray-down method that is cool to the feet. Concrete stamping can be done on existing concrete deck. You may also want to add a bit of color to your pool deck with concrete staining. Pool lighting can make a pool area look more dramatic and enticing for night swimming and pool parties and just for ambiance. There are many ways you can integrate lighting in the pool area. The traditional ones are those found on the deck. They could be lampposts, hanging lights, and more. For the swimming pool, LED lights can be installed underwater, or you may like floating LED lights. These are all energy-efficient, offering more brightness and are safe to use. 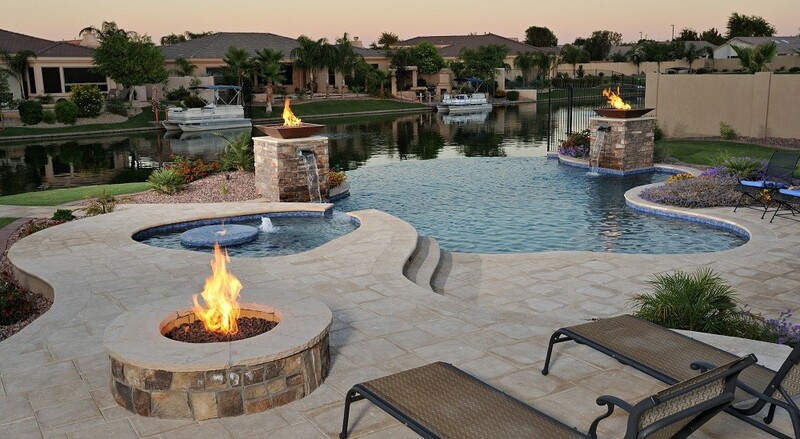 Fire and water features will not only make your pool area beautiful, but they also add more activities, therefore, making it more enjoyable. Fire pits are a great source of heat and illumination. You can use it during the day and most especially in the evening. Water features make swimming more enjoyable and serve as a focal point, enticing you into the environment. Plus the sight and sound of water falling or trickling will make the pool area peaceful and relaxing. Favorite water features include a waterfall, water jets, water wall, rain curtain, Scuppers, Sheet Descent, Sconce, Bubblers, Spillover Spa, Deck Jets, Mist, Statuary, or a fountain in the middle of the pool. You will need to consider the proportion and scale when selecting most of these as you will want to be sure it is not too large. You will also need to find whether you want it to be more geometric or freeform in shape, and if you are thinking of using rocks will you want real or faux? If you are looking to create a resort setting in your backyard them adding a swim-up bar is a great idea. For years they have been a favorite hang out at tropical resorts, and they are gaining popularity in residential backyards. If you want the convenience of, enjoying a drink or snack without getting out of the pool but do not want to install a full blown kitchen, you may want to consider adding a built-in table with stools, like shown below. It is easy to acquire a dreamy pool oasis as long as you have a clear idea of what you want. Also, you need to consider your budget, the size of your pool area, and how it will add value to your home, your property, and your life. When all of these come together, like pieces of a jigsaw puzzle, there will be no room for regrets. Thank you to Decorative Concrete Resurfacing for providing information on resurfacing pool deck surround. will connect you with the right design professionals to remodel or build and design your dream home. Subscribe to get helpful tips and the latest trends in home design. Remember, you can always opt-out.